Opt for smart knitwear every time. Nothing brings together an outfit like a well-chosen jumper. 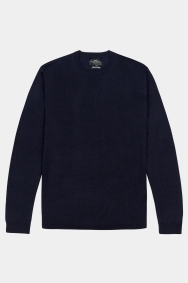 And with this Moss London jumper, you’ll bring warmth into the equation too. 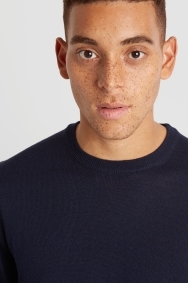 Made in Italy from 50% merino wool, you’ll be comfortable and cosy while staying smart. 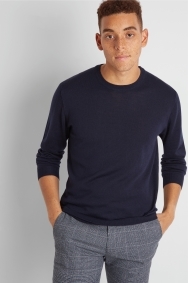 Its plain style will suit the office and off-duty occasions, while its navy colour makes it endlessly versatile. The plain appearance of the jumper will contrast well with pattern, so try it with grey check skinny fit trousers for a smart weekday look. Ready for the weekend? Team it with jeans, or layer it up under a warm jacket. A very nice garment, stylish and very good quality. They all look great quality, value for money well made and packaged well.